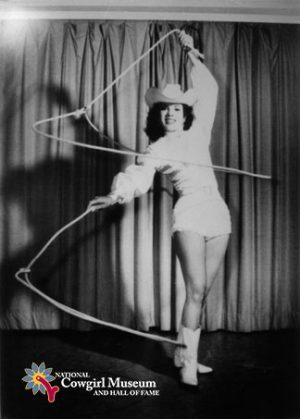 Nancy headlined at the biggest rodeos at age nine, thrilling crowds with her trick riding and roping skills. She rode and roped at most of the major rodeos in the U.S. Her rodeo career began in 1939 and lasted until 1961, when she retired to devote more time to ranching and raising her family. Descended from a Texas pioneer ranching family, Nancy was literally raised in a rodeo arena, often accompanying her father, a champion calf roper.